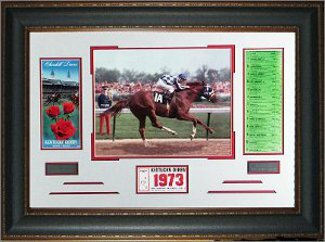 The 99th Kentucky Derby, May 5, 1973, Ron Turcotte atop Secretariat came out of the gate near the back of the pack, then began passing horses on the first turn, caught Sham at the top of the stretch and won by two and a half lengths, running the first and only Derby in less than two minutes, 1:59.4! This historic moment is forever captured in this original 11x14" photograph. Museum Quality Leather Framed as shown with descriptive plaque, replica 1973 Derby ticket and other paraphernalia to an overall size of 22x32" Museum Quality Framed as shown with descriptive plaque, replica 1973 Derby ticket and other paraphernalia to an overall size of 22x32"
This product was added to our catalog on Friday 19 November, 2010.